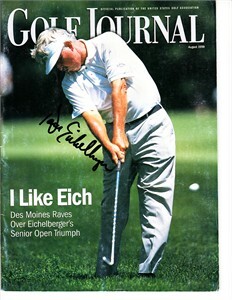 Complete 1999 Golf Journal magazine autographed in black Sharpie by cover subject Dave Eichelberger after winning the Senior U.S. Open. Cover has moderate surface wear. ONLY ONE AVAILABLE FOR SALE. With certificate of authenticity from AutographsForSale.com.